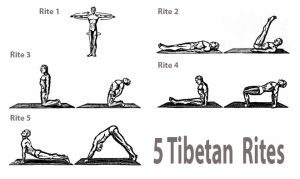 Five Tibetan Rites is an easy to perform system of exercises that can be practiced by everyone despite of age, weight and physical capabilities. It’s a very old set of exercises (more than 2500 years old) first published by Peter Kelder in the distant 1939. His publication was a booklet titled “The Eye of Revelation”. Five Tibetan Rites origin is disputable. In fact it does not matter whether they are derived from Indian or Tibetan forms of yoga practices or predate yoga by as much as a few hundred years. What matters is “their immense potential value for those who will clear 10 minutes a day to practise”. These quoted words belong to another researcher in the depths of the Five Tibetan Rites. His name is Chris Kilham and his 1994 book is called “The Five Tibetans”. I will explain how to perform the 5 Tibetan Rites correctly in order to experience their weight loss and age-reversal benefits. Basic position is standing erect with hands on hips and taking one or two deep breaths – that’s what Kelder suggests in his “The Eye of Revelation” booklet. No specific breathing patterns are required while performing the rites. That’s great because there is no need to know any yoga breathing before trying the 5 Tibetan rites. !!! Caution: In original 5 Tibetan Rites booklet by Kelder, he suggests that when performing the First Rite, the spinning must be performed in a clockwise direction – always! As for the orientation of the palms – both should be facing toward the ground. For the second rite you should lie full length on the ground (use a mat or rug). Place your hands alongside your hips. Keep your fingers close together. Raise your feet until your legs are straight up to a 90 degrees angle. If it’s possible and you feel comfortable, let your feet extend a bit over your body toward the head, but be careful – do not bend your knees while performing this rite. Hold this position for a few seconds then slowly lower your feet to the floor, and give your body muscles a few seconds to relax. Perform this Rite once again. A more advanced technique is to raise your head while your legs are still in the air. Once you lower your feet and legs, lower your head as well – do both head and leg movements simultaneously. For the third rite you should kneel (on the mat or rug you used in the previous rite) with your hands at sides, and palms facing against the side of your legs. This rite has two movements – forward and backward. The first position is as follows: bend your waist and lean forward as far as you can. Keep your chin on chest. The second position: lean backward as far as you can. Keep your head as further as possible backward. Don’t worry – your toes will prevent you from falling over backward. Keep your hands the side of your legs all the time. Return to the basic kneeling position from which you started and let your muscles relax for a few moments. Perform this Rite once again. For the fourth rite you should sit (on the mat or rug you used in the previous rite) with you a straight back and your feet stretched out in front of you. Try to keep your legs as as straight as possible, i.e. the back of your knees must be as close to the rug or mat as possible. Keep your hands with palms facing down on the mat/rug and slightly pointing outward, and fingers together. Chin – on chest. The movement is as follows: slowly raise your body and bend your knees at the same time so that the legs from the knees down are practically vertical at a 90 degrees angle to the ground. 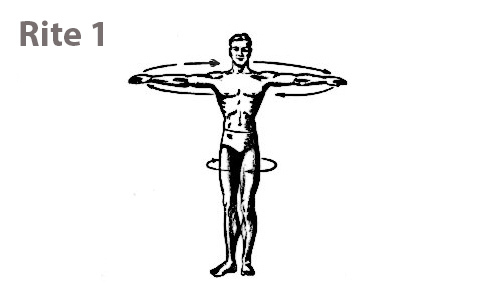 Your arms will also be vertical, while your body from shoulders to knees will be horizontal (check the image diagram). While your body is in that position let your head fall backward gently as far as possible. Hold your body in this position for a few seconds and then return basic sitting position. Relax your muscles for a few seconds and then perform the Rite again. Note: While your body is in raised position – tense all of your muscles! For the fifth rite you should be in the following sagging position: Legs stretched out to the rear with the feet about 2 feet apart; your hands – placed on the floor also about 2 feet apart. Now push your hips up as far as possible until you stand raised only on your toes and hands. While performing this push up your head should keep your chin up against your chest. Slowly return your body to the basic sagging position. Raise your head up as far back as you can. Note: While your body is at the highest point you should tense your muscles for a moment and then tense them again when in the lowest point (basic sagging position). All these benefits result in an overall body and mind well-being. When your body and mind are well then your health will also be good and improved. Starting to feel well in your body is a key moment in anyone’s weight loss journey. The feeling of well-being powers up your will to lose weight. I know that for sure, cause i’ve experienced it more than once… Sometimes I find it extremely difficult to make myself feel good in my body, but when I manage to feel even the slightest improvement in my health and weight – I become even more determined to lose those excess kilograms.